Brand new film that covers the latest Pullingseason. 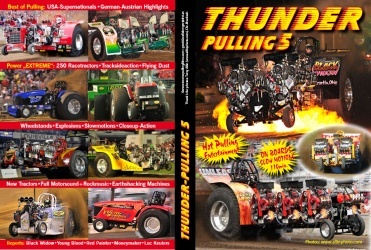 On 110 minutes the new part of the Thunder-Pulling-Series reports about the best and newest American Pulling Machines of the Grand and Super National Circuit and also the German, Austrian and European scene. You will see all the top tractors in the classes Light SS, Modifieds, Super Semis, Minis, DieselSS, TWD, OpenSS, Unlimited Modifeds and Pro Stock. Thunder Pulling 5 will excite you again, with tremendous trackside action, wheelspeed and flying dust, earthshaking pulls also under the lights, over 250 Race Tractors pulling on two powertracks side by side. Presented with good music, slow-motions and great ONBOARD footage on the sleds and tractors, that gives you a new and great few on the Pullingaction. ... and much more ...! If you liked “Thunder Pulling 4”, this new film will even more excite you pulling fans, and flashes the excitement of Tractor Pulling to your livingroom. This is “TRACTOR PULLING ENTERTAINMENT” at its finest – get your copy today. Thank`s to www.allinphoto.com and Christian Brocksch for the coverphotos, and all the Pullingteams for their support.